Ji ll Kessell, of Brompton, has been awarded the title “Volunteer of the Year” at Hambleton Community Awards. Jill has overcome multiple health problems of her own in order to improve the lives of other people in the community. 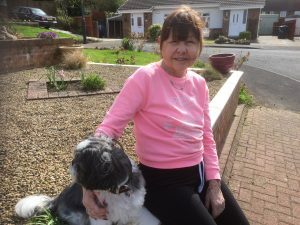 Jill, formerly a nurse, has had kidney and pancreas transplants, three heart attacks, a heart bypass operation and has had an operation to remove a disc in her spine. She is also severely sight-impaired. Despite all this Jill devotes several days a week to voluntary work. She is a volunteer on Hambleton Community Action’s Carers’ Respite Sitting Scheme and visits two homes each week, giving two carers a respite break and giving their dependants an opportunity to socialise with someone outside their family. In addition to this, Jill supports a friend who is also a carer, spends one day a week volunteering at the Friarage Hospital in Northallerton, helping patients to eat, and is involved with the children’s work at her local church. On one occasion Jill was discharged from a stay in hospital after a heart attack, and resumed her voluntary activities the same week. In addition to the Carers’ Respite Sitting Scheme, Hambleton Community Action also runs a Community Visiting Scheme to relieve social isolation, and a Community Car Scheme to help those who cannot access public transport get to appointments. Volunteers are needed for all three schemes, and anyone interested should email Yvonne Jackson on email projects@hambletoncommunityaction.org or ring 01609 780458. Car owners are needed for the Community Car Scheme, but for the other schemes all that is required is the ability to enjoy a cuppa and a chat.